With Kyogre and Groudon returning January 15th for the Hoenn event, the world needs to know: which Pokemon may we turn to in Earth's hour of terror? Who will champion both the God of the Sea and the God of the Earth? Rayquaza? Apparently, he’s got more important things to do. Fortunately, we have Breloom to pick up the slack, and he now has a cool new move: Grass Knot. Until January 29th, all Shroomish evolved into Breloom will learn Grass Knot. While everyone’s favorite mushroom Pokemon obtaining a new attack is certainly a reason to celebrate, the question must be asked: Is it a buff for Breloom? And if it is a buff, is the buff significant? And what about PvP? These details are covered in the article below. Until recently, Breloom’s utility in Raid Offense has been centered around it being a Fighting-type Pokemon. Unfortunately for Breloom, despite having a higher attack stat and more style than Machamp, it has always been behind it in raiding value as it lacks the bulk to be truly effective. Rather than further developing Breloom’s Fighting-type role in the meta, Niantic chose to buff Breloom in a way no one expected by giving it Grass Knot. Due to the power of Machamp and Metagross, the Gym Defense Tier List has emphasized the use of bulky Water-type Pokemon. For example, if a trainer were to follow up a Blissey with a Milotic, few Pokemon could easily and optimally hammer through both. Now that Breloom has access to the most powerful Fighting-type charge move and the most powerful non-community day Grass-type charge move, there is a clear and defined answer. Despite Breloom’s advantage in coverage, 50k stardust to unlock its second charged move is a steep investment. More frugal players may want to stick to swapping out Pokemon mid battle (or just mash away at the gym blindly with literally anything because potions and revives are near endless in supply). A stronger case could be made for this investment if Grass Knot + Dynamic Punch Breloom performed well in either the Ultra or Master League of PvP. As the next section will detail, Grass Knot is not exactly hot in PvP. As such, trainers may want to limit their special Grass Knot Breloom’s to one charge move. 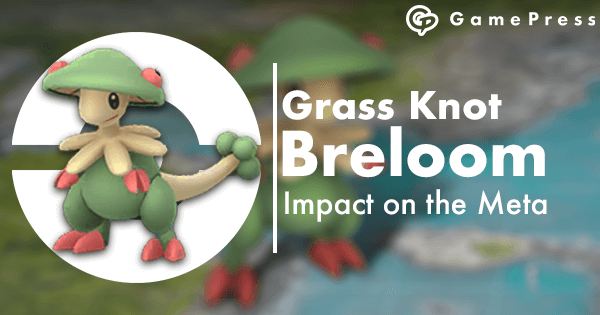 Breloom is already powerful contender for PvP in all three leagues as it is able to act as a hard counter to powerful Ground and Water-type Pokemon while also checking Grass and Steel-type Pokemon with its resistances and Counter. You would think that Grass Knot’s advantage in damage per energy would enhance Breloom in this arena, but unfortunately it’s a bit too slow. With Grass Knot costing 10 more energy than Seed Bomb, Breloom loses matchups it should otherwise win. In the Great League, Whiscash has a greater opportunity to charge and use Blizzard. In the Master League, the Groudon fight may come down to a coin flip. These are two fights Breloom accomplishes easily with Seed Bomb, but can lag behind in with Grass Knot. Outside of these specific matchups, Breloom loses its utility and threat of having a the low energy cost charge move to bait shields and finesse victories that would otherwise be losses. If you were to use Bullet Seed over Counter the activation time of Grass Knot would fall more in line with Counter + Seed Bomb. However, fixing Grass Knot’s high energy cost problem with Bullet Seed opens up a whole host of issues with Breloom holistically in PvP because Counter is just that good. Breloom would change from a powerful Counter user that has Grass-type coverage to an adjunct Grass-type Pokemon that is fundamentally inferior to Meganium, Sceptile, Ivysaur, and Venusaur (League Permitting). Any value found in Bullet Seed + Grass Knot Breloom would be in specific niche matchups that may hinge on the surprise factor alone. Grass Knot Breloom is useful as a low investment raid attacker if you evolve weather boosted Shroomish as it has powerful Grass-type DPS that counters both current T5 raid bosses. Stardust investment isn’t advised as trainers will likely meet equal success with their Roserade, Frenzy Plant Venusaur, and/or Alolan Exeggutor. For gyms, Breloom has interesting “anti-meta” utility with the combination of Dynamic Punch and Grass Knot but the 50k stardust limits is usage to the board and bourgeois. In PvP, Grass Knot is often critically worse than Seed Bomb for Breloom, as the 10 higher energy cost will cost Breloom many matchups it’s meant to win. It could find niche use in the PvP arena, but it’d likely only be as a surprise factor. Overall, the buff is relatively neutral in power but fun in flavor.